Discussion in 'Fiddleback Forge Knives' started by Odaon, Apr 14, 2019. 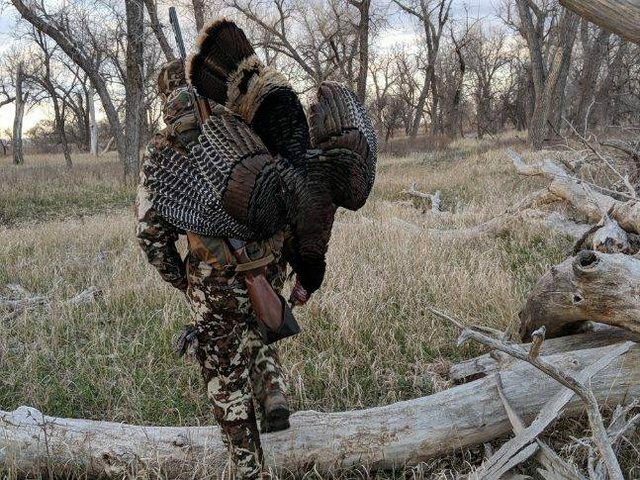 The Colorado spring turkey opener was yesterday and I had a tag in my pocket that I waited 2.5 years to draw. My buddy and I headed out Friday after work, did a little scouting, and set up camp. We got up at 500 am yesterday and headed into an area we thought would hold turkeys. 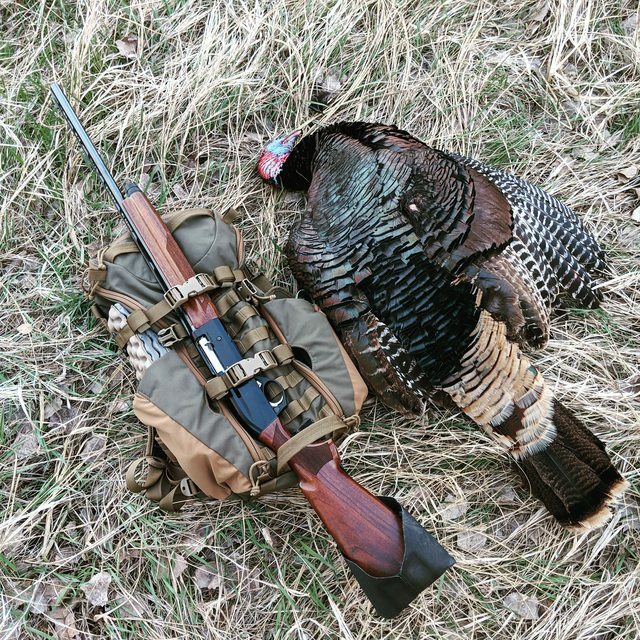 Our suspicions were confirmed by several turkeys gobbling from their roosts as we got our packs on. We hiked in a ways and watched one of the gobblers fly down from the roost. After following the directions they flew we came upon a flock of at least dozen toms, jakes, and hens doing their turkey thing. Lots of strutting and gobbling. I tried and failed to call a tom out of that group, so decided to sneak in as close as possible. I got within range, but never had a shot before the turkeys moved out of the area for their daily feeding routine. After taking a lunch break, we decided the sit in the same area a wait for them to return that evening. After a 5 hour sit in the light rain and snow two toms came in pretty quickly. I wasn't sure if they were coming to my occasional calls or just returning to roost, but they were here and I wasn't going to waste the opportunity! 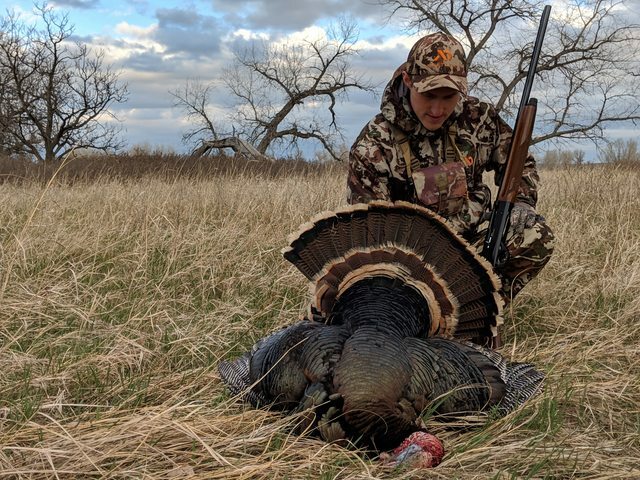 I quickly got my shotgun up and dropped the second bird at 25 yards! A tag filled on a successful season opener! I used my F2 with commando Burlatex to gut and later skin and part out the bird. As usual it was great for the job! Fiddleback, varga49, TmBtc12 and 11 others like this. Nice job! I'm sure you'll turn that into some delicious meals! Nbrackett, varga49 and Odaon like this. Nice job bro!!! Congrats on a successful day. How are you going to cook him?? Very cool. Thanks for sharing. 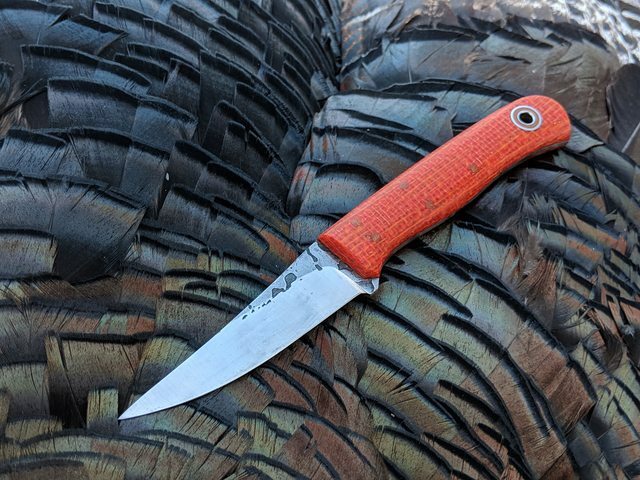 I love hunting stories and I am always curious to know what knifes are used on these great adventures. Congrats! Thanks everyone! I had never hunted this spot before, but have a friend to point me in the right direction for the area! Exactly! We didn't have to shock gobble them because a real owl was hoping away and the turkeys we're happy to respond to that one. Haha! Thanks man! It was a good hunt. I parted him out today. Thinking I'll smoke some breast, schnitzel some more, maybe bread and fry up the breast tenderloins. The legs and thighs will be used for some sort of slow cooking application. Not sure what yet! I have some other ideas and recipes I want to try as well, like breakfast sausage, but only have so much turkey! Luckily I have another tag for a different area. We'll see if I can double up on the season! Odaon and schmittie like this. Thank you! It was a fun hunt! Sounds like a tough opening day. That's a bummer on Sunday! How long is your season?